Please Credit Photo: Karen Arceneaux. Photo by Kyle Froman. Karen received her B.F.A. in Choreographic Design from the University of Louisiana-Lafayette (ULL) and Master of Arts Degree in Organizational Management from the University of Phoenix. She has trained at the American Dance Festival in North Carolina, The Martha Graham School of Contemporary Dance and The Ailey School. After graduating from The Ailey School, Arceneaux worked as the Administrative Assistant to the School Director and B.F.A. Program Co-Director. She later served as the School Administrator from 1999-2004. Since 1999, she has choreographed for the annual Christmas concert at Saint Paul’s Church in New York, working with dancers from the Ailey/Fordham B.F.A. Program. She has also choreographed for ULL and various performance groups and school programs at The Ailey School. 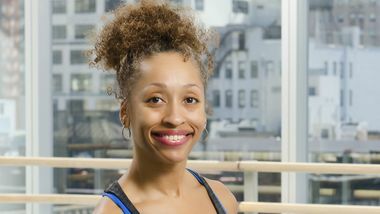 As the Founder/Artistic Director of Genesis Dance Company, L.L.C., her work has been presented throughout New York, Connecticut, Michigan, and South Carolina. Arceneaux was featured in MORE magazine in a campaign called “Strong Suits”, celebrating the strength of women who use their bodies in professions such as dance, stunt work, and fitness. Dedicated to fitness and always enthused about creating new programs to help individuals reach their personal fitness goals, Arceneaux is a certified personal trainer, weight loss specialist, and TRX Suspension trainer. She is also a certified group fitness instructor and Zumba instructor. Never relenting in her mission to be an inspiration to others, Arceneaux teaches and trains privately in NYC and Long Island and has her own Elite Physique247 fitness class schedule in Long Island that is growing in popularity. (New York) July 20, 2018 – Ailey Extension invites dancers to find their summer groove with exciting workshops and master classes. In addition to its annual Summer Performance Workshop series, Ailey Extension will offer an Alonzo King LINES Ballet Master Class with Meredith Webster and a “Werk That Twerk” workshop with famed hip-hop instructor TweetBoogie. These opportunities allow students to refine their technique, boost stage presence, and perform movement highlighting their personal style while learning from some of New York City’s top instructors at The Ailey Studios. Each summer, Ailey Extension invites students to take their dancing to another level and unleash their inner performer. Beginner and advanced beginner dancers are welcomed to enroll in a four-week Summer Performance Workshop to learn and showcase choreography from some of Ailey Extension’s top instructors. To celebrate Women’s HERstory Month in March, Ailey Extension presents two workshops to promote health awareness and empower women of all shapes and sizes. On Tuesday, March 14th at 7 p.m. three of Ailey Extension’s top dance and fitness instructors – Sarita Allen, Karen Arceneaux, and Sarah Rozek – lead a Women’s Health and Fitness Day workshop. On Saturday, March 25th at 7 p.m. Pretty BIG Movement’s founder and CEO Akira Armstrong instructs the Move Your Curves workshop designed for voluptuous, plus-sized women. Facebook Live: We're doing a full-body, HIIT dance workout with Karen Arceneaux from Ailey Extension. Join in! Karen Arceneaux is about to deliver some bad news for the group of advanced-beginner Horton students assembled before her: She's cutting the counts in half for an already tricky exercise. It's hard to believe Karen Arceneaux's formal dance training began when she switched her college major from chemistry to earn a BFA in choreographic design. Arceneaux immediately hit the ground running, training at the American Dance Festival, the Martha Graham School of Contemporary Dance and The Ailey School, where she was mentored by internationally recognized master teacher Ana Marie Forsythe.